Leading Manufacturer of plastic end caps from Chennai. Pipe caps / Plastic End caps / End protector- are used to cover the ends of pipe from damage of bevel & Foreign particle ingress. 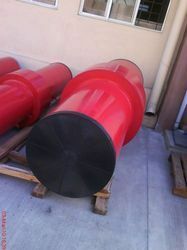 We offer OD caps with high quality & affordable price.As on today VP Engineers are the only one manufacturer in India to produce vast variety of sizes starts from 0.5" to 120"
Used us reflectors while transporting bigger size pipes which adds additional safety. Resist against direct sunlight for longer duration. Looking for Plastic End Caps ?